Antibodies against C. suis are transferred via the sow's very first milk to the piglets immediately after birth. This was discovered by veterinarian and parasitologist Lukas Schwarz and his colleagues in 2013. These findings prompted the researchers at the Institute for Parasitology to look for a way to increase the level of these antibodies in sows. The ultimate goal was to provide the piglets with as much antibodies as possible via their mother's milk during the first few days of life. The idea paid off. Piglets from infected sows suffered less from the infection than piglets from non-infected sows. Overall offspring from immunised mothers had less severe diarrhoea or no diarrhoea at all. Piglets that became ill recovered faster and excreted fewer parasites compared to those from non-immunised sows. "An infection with Cystoisospora suis causes serious gastrointestinal disease in piglets. The infection is continues completely asymptomatic in adult pigs", explains lead author Schwarz. To stimulate antibody production against Cystoisospora suis in sows, researchers exposed pregnant sows to infectious stages (oocysts) of the parasite two weeks before parturition. Oocysts as the primarily infectious stage stick to the floor and other objects in the farrowing barns. Piglets ingest them and the parasite colonizes the gut, attacking the mucous membrane. The parasites multiply in the body before being excreted and the cycle starts again. Cystoisospora suis can survive in pigsties for a number of months and is very hard to kill. This leaves farmers faced with the likelihood of new infections. Sows also ingest the parasite, but due to age resistance they are not affected by this coccidian parasite. High concentrations of antibodies against the parasites are passed on to the piglets in the first few hours of life through their mother's milk, where they enter the blood stream and the intestines of the newborns who cannot yet produce their own antibodies. These maternal antibodies protect the piglets from infections in the first few weeks of life. The higher the concentration of antibodies in the sow's milk, the better protected her offspring are. 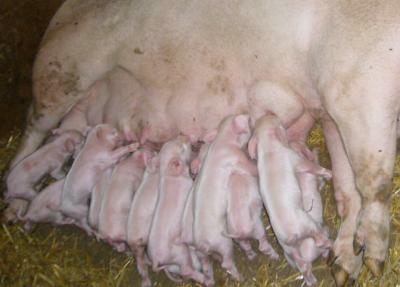 Piglets with milder symptoms showed higher concentrations of IgA in their blood. These immunoglobulins are not just in the bloodstream, they are primarily found on the surface of the mucous membranes including the intestines where they serve as a defence against pathogens. Researchers found equally high levels of IgA in the blood of the infected mothers. "To date it has been assumed that immunoglobulins do not play a role in the course of swine coccidiosis. Our results provide the first indications that immunoglobulins could actually be quite important. Additional studies are required to identify the exact role played by the antibodies", Schwarz explains. Researchers found particularly high concentrations of IgA in the very first milk known as colostrum, a highly nutritious milk all mammals ingest during the first days of life. This form of "milk vaccination" might serve as a basis for developing an immunisation strategy to prevent swine coccidiosis. Piglets from infected sows are protected from severe infections. "There are some effective medications for swine coccidiosis, but we would like to use the piglet's immune response to stop it in its tracks before the infection even gets started," lead author Lukas Schwarz concludes. Neonatal porcine coccidiosis caused by Cystosisospora suis is a severe parasitic disease of the intestinal tract of neonatal piglets caused by the unicellular organism Cystoisospora suis. Coccidiosis is associated with extensive destruction of the gut mucosa and thus with reduced food conversion, causing decreased weight gain and economic losses for farmers. Infection with Cystoisospora suis results in heavy diarrhoea and may cause fatalities if secondary bacterial infections are present. For animal welfare considerations as well as for economic reasons there is considerable interest in trying to control the disease.